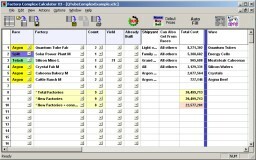 that is : to show the potential inputs and outputs for a given factory complex setup. that is : to predict the actual dynamics of ware use & production (& profit rate) + it's potential for stalling. Use of this 2nd feature is optional, you don't necessarily need it to design complexes. -There is a lot more visible data content in Merroc's spreadsheet, plus asteroid information. -Some features seen in the spreadsheet are absent, other features have been added (or possibly improved). -information - without this, I certainly would not have got started. calculated from values seen in game-files, and is far more accurate than previous versions. Added column to show TL cargo-size of factories. Fixed silly low XXL-silicon-mine prices. 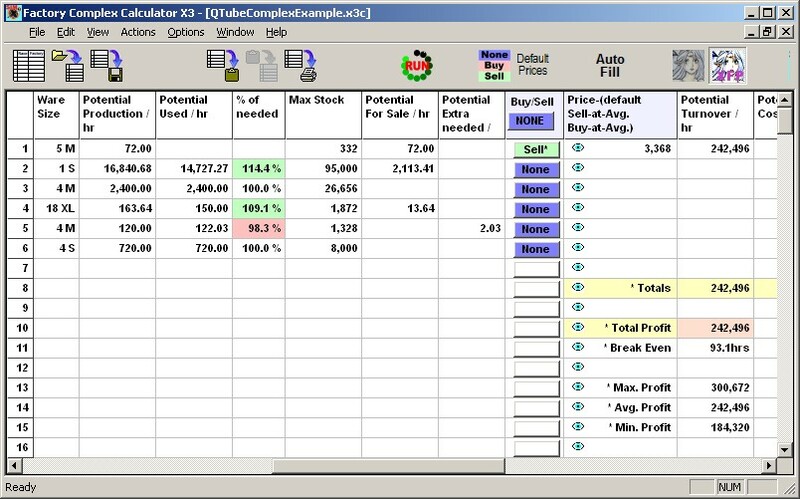 Can now enter 0 as the product/resource price (to allow for 'seperated' complexes). Can now choose race colours to match ScorpBy's active map utility. Added an Auto-Fill facility allow automatic filling of all resource factories. Put Tractor Beam Factories in. Simplified simulation (more like in-game now, I think). (1st 6 columns from spreadsheet <---> 1st 5 columns of this util's grid). Now installed with an installer program & can be easily uninstalled. Included required system dlls in the installer (the smaller download below doesn't have them). Last edited by Deleted User on Mon, 18. Jun 07, 21:13, edited 13 times in total. The only suggestion I have is updating the version number a little higher when you add a really cool feature like the AutoFill. For example, go from 2.0.0.0 to 10.0.0.0. Great tool! Thanks for writing it! It should be those 2 64-yield mines. The sim could be run on the premise that stock doesn't build up then stall (which will happen in ur complex), meaning excess is sold off immediately, allowing the mines to constantly produce. That'll account for massive needs for energy. I think I may be confused . It makes lots of Silicone. It's the energy I have problems with. Or are you saying that when the mines stall then I will have the extra energy I need? Then, look at what the program outputs. That will be the exact number and type of factories you need to fully meet the supply requirements for the 5 Space Fuel Distilleries. The only confusing point is the crystal usage. It will say that you only have 98.3% of the needed crystals. Just ignore that. 5 Crystal Fabs is the right number to supply the SPP XL. This complex uses quite close to 100% of the energy cells produced. When I input all the factories from your complex, the SPP XL only supplies 72.7% of the necessary energy cells. In other words, you don't have enough energy cells to keep all FOUR of the Silicon Mines producing at 100%. Really, you have just enough for the two 26 yield mines. Hi Dave... can I request something? Under the Buy/Sell/None, could you add a "Self", toggling a "magic supply" from the player? Thus the simulator can be run for complex configurations where certain resources are 0% needed but still run. In other words, if a "% of needed" is 0.0%, I can force it to 100% regardless. I sometimes create plans based on single sectors, but that sector's supply of eg crystals is taken from my own crystal complex outside the sector: I don't want to "pollute" the calculations for the current sector. If you build a complex with a SPP XL that needs 5 Crystal Fabs but you will only include 4 in the complex and get the other 20% of your Crystals from a comples out of sector, then you can either leave the Buy/Sell button set to NONE. In this case, the SPP XL only runs at 80%. Or, you can click BUY. Then, it will run at 100% but you incur a $219, 335 cost per hour. In order to simulate getting those crystals for free from your own fab/complex outside the complex, just set the buy price to zero. Oh... Well, you can't do that in the FCC because it requires you to put in the minimum cost for the resource. If you could *force* that value to be zero, then would that pretty much simulate what you are asking? 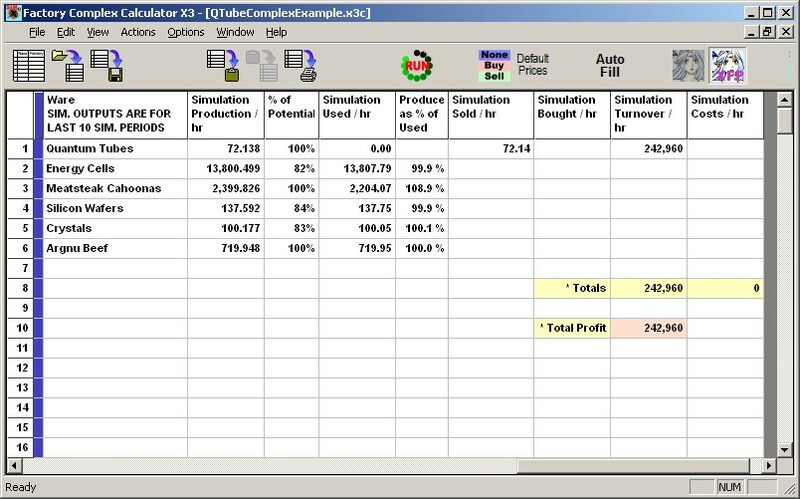 Before you run the simulation, for the Energy Cells resource, set the Buy/Sell to Buy and then look at the number. It should show 31,655.83 energy cells that need to be bought per hour in order to operate the complex at 100%. If you set that to Sell instead of Buy, it looks like the Simulator will run the complex at the maximum output supported by the energy cells on hand while selling what is leftover. So, yes, it will show that you have 1000 available for sale ever hour. But you are only running the factory at about 73% of its total capacity. That was it exactly Thanks a bunch. Shows I am 9300 short per hour. Which is what I came up with. zergfest90 wrote: If you build a complex with a SPP XL that needs 5 Crystal Fabs but you will only include 4 in the complex and get the other 20% of your Crystals from a comples out of sector, then you can either leave the Buy/Sell button set to NONE. In this case, the SPP XL only runs at 80%. Or, you can click BUY. Then, it will run at 100% but you incur a $219, 335 cost per hour. Can't... the exe doesn't allow me to type in values outside the defined ranges. In fact the exe doesn't allow me to type in anything, since it's not really an Excel. Also, if *any* resource is at 0% the simulation (the one that runs 250hrs) will stall. 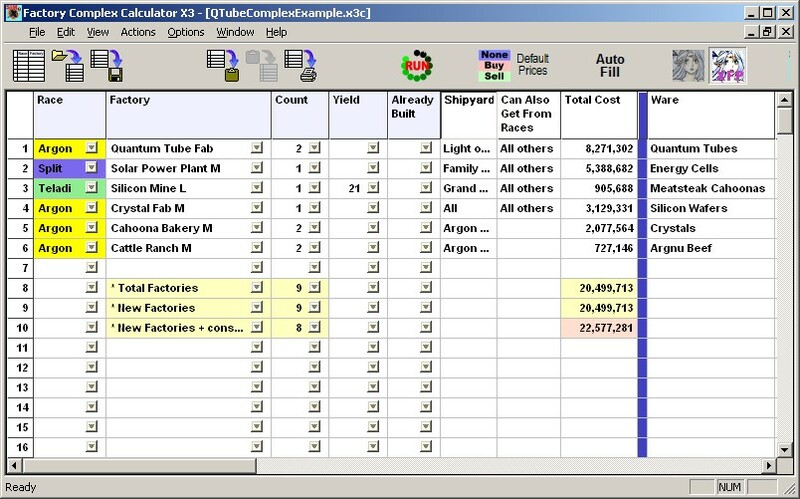 I'm trying to simulate a sector's fabs where there's a single SPP-XL fueling a number of fabs, but its entire crystal supply is outside sector. On top of that, the crystal complex's ecell supply is fueled by its own SPPs. My first complex stabilizes in the simulation after 800 hours. However, in game I can make it happen slightly sooner. but I think zergfest90 is on the right track about your complex Vanel. It shows that I have 0% of the needed crystals. But the FCC defaults to "BUY" in the Buy/Sell column. When I run the simulation for 250 hours, it shows that it needed to buy $546,619 worth of crystals per hour. But the Rimes and Wheat L ran at full potential. If you wanted to simulate an outside source of crystals, you should be able to do that right now except that you would need to subtract out the cost of the crystals. Right now, the program lets you type in a value in the column immediately to the right of Buy/Sell. But it only lets you type in a value that is between the minimum and the maximum. If it were possible to set that to zero, then you wouldn't need to subtract out the cost of the crystals you are getting free from the external complex. I think you just need to make sure the Buy/Sell button is set to Buy for the crystals in order to make the simulation run.